What's your type? Suddenly everyone's obsessed with fonts. 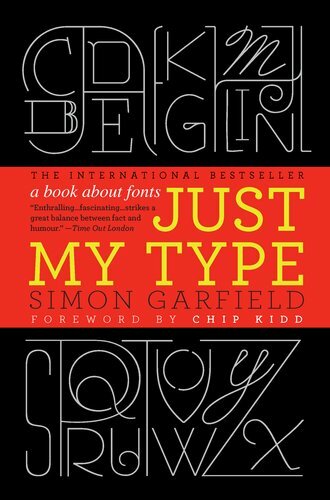 Whether you're enraged by Ikea's Verdanagate, want to know what the Beach Boys have in common with easy Jet or why it's okay to like Comic Sans, "Just My Type" will have the answer. Learn why using upper case got a New Zealand health worker sacked. Refer to Prince in the Tafkap years as a Dingbat (that works on many levels). Spot where movies get their time periods wrong and don't be duped by fake posters on eBay. Simon Garfield meets the people behind the typefaces and along the way learns why some fonts - like men - are from Mars and some are from Venus. From type on the high street and album covers, to the print in our homes and offices, Garfield is the font of all types of knowledge. Publishing October 14th 2010 by Profile Books. Great choice! I have seen these a few places now and think it sounds really interesting. What's My Type is a wonderful book (my thoughts: http://manoflabook.com/wp/?p=2648). Not only interesting, but humor­ous and entertain­ing as well. I've never heard of this one before it sounds pretty cool I'll go check it out on GR.